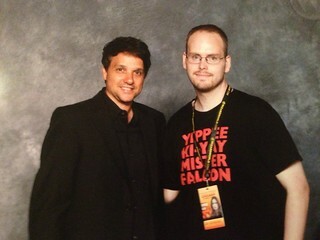 It probably won’t be another 3 months until I’ll have another convention recap to write, so I figured I’d share some pics and any stories that I can remember from my first 4 conventions. My first convention ever was in 2013. In late June, on a boring midnight shift, I saw an ad pop up about Wizard World Chicago. I’ve always wanted to go to a convention and the guest list was pretty stacked, so I decided right then to make a purchase and take the trip there. 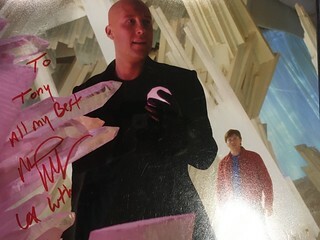 While I couldn’t save up to get everyone I wanted to, I did manage to get some people from my favorite shows; namely Summer Glau, Morena Baccarin, Ralph Macchio, Allison Mack, Michael Rosenbaum & James Marsters. 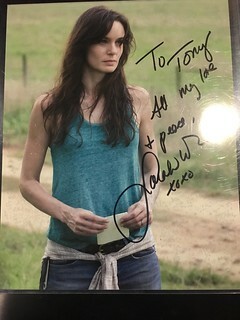 The last two were autographs only. Of my early cons, I felt this one was run the smoothest. Chicago has always been their big show and line management was on point. Celeb Photo Ops was the pro company, but it was back before they had the technology to print out photos after you were done. All the photos were at least an hour wait. 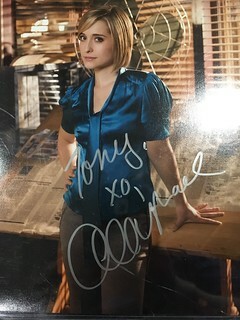 One of which, my Allison Mack photo, shows me with my eyes partially closed and I couldn’t get a retake since her time had already passed due to the wait. Only reason my eyes were closed was because we were having a convo during the photo and the picture taker got impatient, and started to count down from 3 for the pic. Allison was able to pose but I wasn’t so lucky. 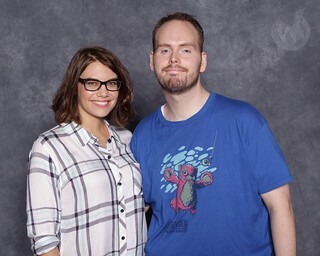 Luckily I was able to get a proper photo with her 2 years later. On to the pics! 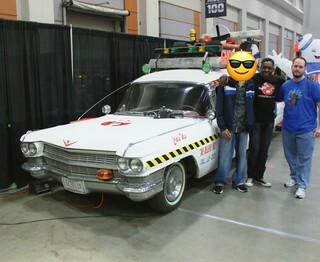 My second convention was in my hometown, DC at AwesomeCon 2014. This one was run totally different than the Wizard World show and I wasn’t prepared for that. Namely if you didn’t pre-order pro photos at this show, they were pretty much all sold out. 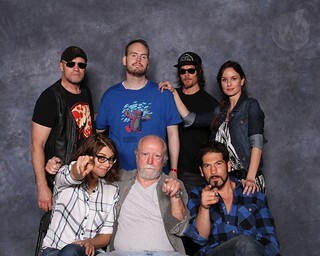 The big ones that I missed were Danai Gurira & Melissa McBride from the Walking Dead and Billie Piper from Dr. Who. I did manage to get a couple pro photos. 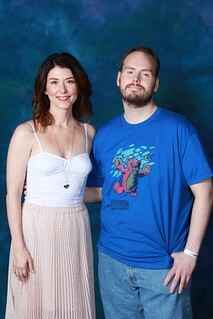 Jewel Staite and a split with Ernie Hudson, next to the original Ecto 1 from Ghostbusters II with a friend of mine. This was also the first show I started my major autograph project; my Buffy The Vampire Slayer shirt. 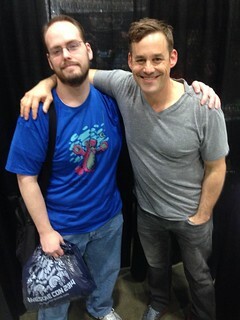 Nicholas Brendon signed it first. His autograph came with a free photo and a free hug. I took him up on both. 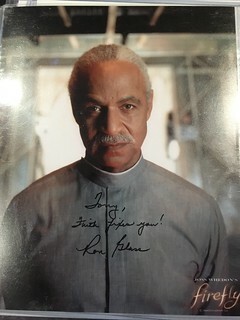 Finallly, got an autograph from Ron Glass. 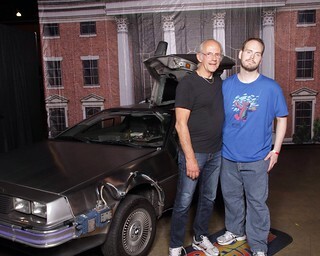 My third convention was my first time since a teen visiting Philadelphia, Wizard World Philly 2014. I didn’t hold back at this show, even though I did miss some photo ops I wanted to get (Alan Tudyk, Matt Smith, John Cena & The Bella Twins)...but the gains I got were great. 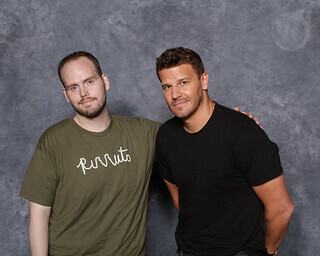 I got to add David Boreanaz, James Marsters and Eliza Dushku to my Buffy Shirt, got combos with Lauren Cohan & Sarah Wayne Callies, autograph from Bruno Sammartino for my father and finally just photos with Christopher Lloyd, Nathan Fillion, a Guardians of the Galaxy trio photo and a 6 person Walking Dead group photo. 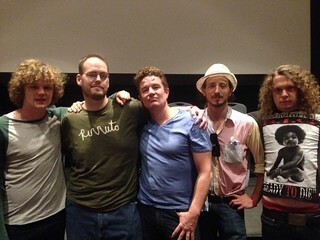 Of the noteworthy things I remember in detail, my photo with James Marsters was with him and his band. They were performing an acoustic set down in one of the panel rooms. During the set, Curtis Armstrong appeared and people went up to him to get a photo. 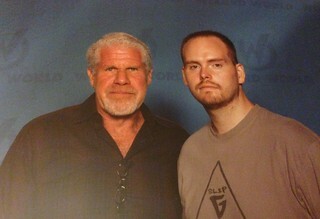 I followed suit, but he literally stopped taking photos right before me. 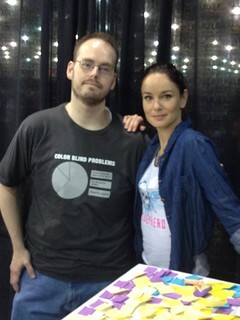 Also, while waiting in line for Eliza Dushku, who looked absolutely gorgeous there, standing in line behind me were DJ and CM! 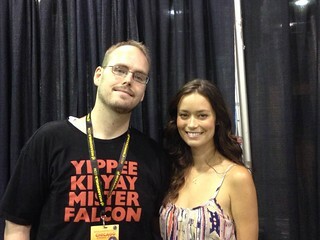 This was a year before I knew of this site, but I found this site while looking for comic con reviews and I happened to recognize them. 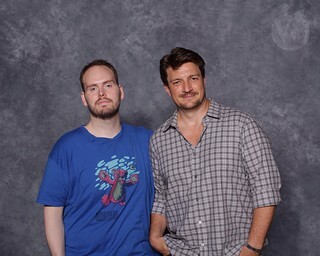 This was also the last time Celeb Photo Ops used their old printing style, because printers broke down and pictures were taking hours to print out. I had to come back the next day to find some of my photos. One of which had a shoe print on it! 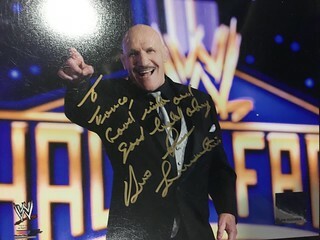 The Bruno Sammartino autograph is a heavy story, because it dates back to something my father did for me as a teenager. Shawn Michaels (my favorite wrestler) was signing autographs at an AutoZone type store and I couldn’t get off from work to attend it. 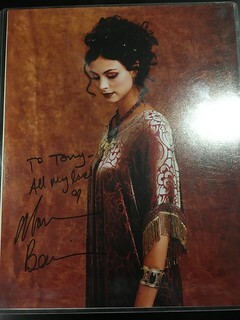 I begged my father to go and he did, getting me the autograph. I always wanted to find a certain way to repay him and this Bruno autograph for him was something I thought was perfect because Bruno was his favorite when he was growing up. Issue was I didn’t know if I was going to be able to even go to this show because my father’s health was deteriorating; he had multiple sclerosis and had been bedridden for some time. I was helping take care of him when I wasn’t working and he urged me to go to the show. When I came home from the con, I gave him the autograph and he was quite moved since I never mentioned Bruno would be there. Sadly though, he passed away that night. This whole weekend was pretty much a roller coaster of emotions from the highest of highs to a reality check back home. 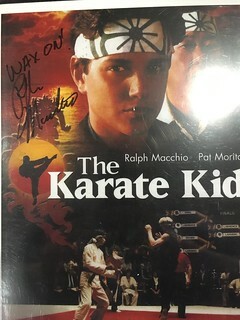 Many times I had wished I stayed home for those final days with my father, but I’m reminded by my friends and myself that he wanted me to go there and one of my final gestures for him was to get him this autograph. Finally, my last pre-Marked Out convention was Wizard World in Richmond, VA in 2014. 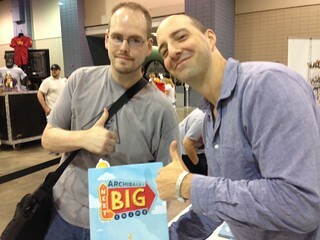 Only reason I went to this con is because I had won free tickets to it from some online blog. It originally had a decent lineup, but it got marred with cancellations. Double digits from what I remember. I also can’t help but not forget that all the scheduled female celebs cancelled, so it quite literally was a sausage fest, guest wise. 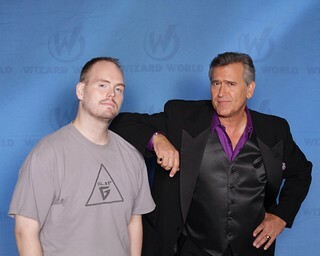 They were lucky enough to get Bruce Campbell to confirm and attend a few days before the show. 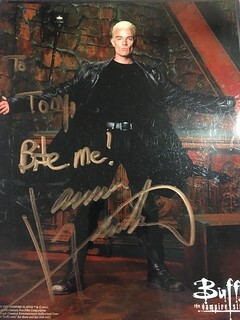 I went down there for a day and got pro photos with Bruce & Ron Perlman, got Batista and Michael Rooker to sign my Guardians pro photo from Philly (would later get Karen to sign it at RICC) and got a children’s book signed by Tony Hale, which came with a free photo. I hope you all will enjoy these photos and stories. I debated on whether to include the Bruno part, but I kept it because it literally was a turning point in my life. My father always wanted me to do what makes me happy and going to these conventions for the most part, achieve that goal. My next guaranteed convention will be Awesome Con in DC since I want to pretty much stay local this year, but might venture to WW Philly, NYCC or Heroes FanFest in Atlanta, depending on the guest list. Until next time. 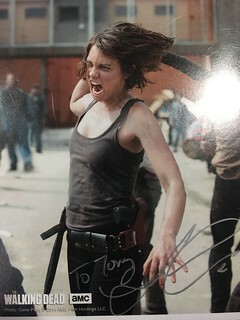 Very cool story to go along with these photos Tony. Made for a great read. 2013? Damn, ur still a convention virgin! Just how the hell did u entertain urself all this time dude? LOL man, I think my first con was 1990ish. And my heartfelt condolences on ur father's passing, even if few years too late. And agreek, he knew u found ur passion and enjoyment from these cons, so, I'm sure he doesn't want u to have any regrets. Also I tell my friends all the time that there's always some story behind each and every graph or photo op I get. U are no different, thanks for sharing. Thanks, DJ. Yeah that was one of my favorites as well. And yes that GOTG photo line was brutal! Almost 2 hour wait for that. Was my longest wait until last year, Stranger Things Duo at NYCC and Dr. Who duo at Awesome Con are now my longest ones. I even remember talking with people in line, believe you were there, about if the movie was even going to be a success since it hadn't come out yet and if it wasn't, we would have waited for nothing! I even remember talking with people in line, believe you were there, about if the movie was even going to be a success since it hadn't come out yet and if it wasn't, we would have waited for nothing!